A couple of recent releases feature benefit concerts devoted to two of the greatest theatre composers of the twentieth century. Both were recorded in Los Angeles and feature many of the same performers. Most of the material is familiar but the quality of the performances is generally high and fans should find both CDs attractive. Jerome Kern: Life Upon the Wicked Stage features a larger band and is generally more of a crowd pleaser.With most performers only given a single number, each is determined to make the most of his or her three minutes and the results could rarely be described as subtle. The recording opens with Jamie Anderson&#146;s powerfully sung "The Song Is You" after which Jane Lanier has great fun with "Wouldn&#146;t You Like To Spoon With Me" and Pamela Myers &#150; still in fine voice three decades after Company – offers an intense "The Land Where The Good Songs Go," one of few unfamiliar numbers. Other highlights of the first act include Lee Lessack&#146;s lushly romantic "The Folks Who Live On The Hill," Melissa Errico&#146;s warm and tender "In Love In Vain" and a thrilling version of "You Are Love" from Dale Kristien and Hugh Panaro. After the interval Jane Carr and Roger Rees enjoy themselves with "A Fine Romance" and Joely Fisher turns torch singer on a searing coupling of "Don&#146;t Ever Leave Me" and "Why Was I Born." Joan Ryan takes the evening to new extremes when she goes way over the top with "Yesterdays" (perhaps you had to be there) but things improve with Valerie Pettiford&#146;s classy, soulful take on "Can&#146;t Help Lovin&#146; Dat Man" and Hugh Panaro&#146;s dramatic but perfectly controlled "The Way You Look Tonight." Carole Cook, the highlight of many a S.T.A.G.E. benefit, tops the bill with a touching monologue about the last hours of Kern&#146;s life and a tender interpretation of "I&#146;ve Told Every Little Star." The Weill evening benefits from one or two slightly less intense performances but also suffers from some particularly cheap sounding synthesized strings. The first half is the best with a collection of great turns beginning with Charlotte Rae who recalls appearing in The Threepenny Opera with Lotte Lenya in 1954. Jane A. Johnson is right on the money with a bluesy "Economics," Linda Purl&#146;s "Barbara Song" and Nancy Dussault&#146;s "That&#146;s Him" are convincingly theatrical and Norm Lewis offers an exciting, gospel-tinged "Apple Jack." A husky Sally Kellerman is surprisingly effective on a sensual "Speak Low" though Rod McKuen fails to make very much of "September Song." The second half features some less than ideal performances &#150; Melissa Dye, in particular, is tiresomely shrill on "What Good Would The Moon Be" &#150; but Carole Cook (again) gets things back on track with a (truncated) "Saga of Jenny." It&#146;s difficult to tell how seriously we are meant to take Tim Curry&#146;s "Surabaya Johnny" (it probably worked better in the theatre), but it is lovely to have Shirley Jones&#146; "My Ship" and Brock Peters more than does justice to the evening&#146;s fitting conclusion, "Lost In The Stars." The sound on both recordings is excellent and the producers have wisely kept applause and between-song patter to a minimum. 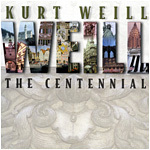 Although many of the arrangements (particularly on the Kern disc) are resolutely contemporary, most of the performers understand the essential theatricality of this material. It is good to be reminded that most of these songs started out on Broadway before they became pop and jazz standards.